Frontier lawman; killed Billy the Kid. 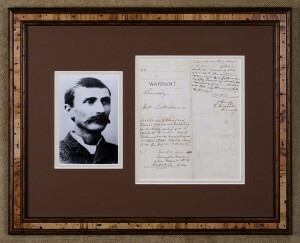 Arrest Warrant Signed, “Pat F Garrett / Sheriff of Lincoln County,” July 24, 1882, octavo. The warrant is for the arrest of Ed L. House who is accused of “willfully and maliciously” killing one Juan Chavis of Pino on July 20, 1882. The Warrant, written by Frank H. Sea, Justice of the Peace of Lincoln County, is dated July 22nd, 1882, and addressed to the Sheriff of Lincoln County (Pat Garrett). Garrett certifies that he ? A year before this arrest warrant, Pat Garret solidified his fame as a lawman and a gunman by tracking down and arresting and later killing (after he escaped) the notorious outlaw and leader of the Lincoln County War, Henry McCarty who was better known as “Billy the Kid.” McCarty/”Billy the Kid” was said to have killed 21 men, one for every year of his life. Patrick Floyd Garrett was a gunman of some repute when he was appointed as Sheriff of Lincoln County in November 1880 on the promise that he would restore law and order. By December, Garrett had killed a member of McCarty’s gang; two days before Christmas the sheriff’s posse killed another gang member and captured the Kid and his companions near Stinking Springs (New Mexico). Though he stood trial and was convicted, the Kid managed to escape from the Lincoln County jail on April 28, 1881, after killing his guards. By July, Garret was on his trail again. He learned he was staying with a mutual friend and while stories differ, apparently surprised the Kid in the middle of the night by hiding in a bedroom of the house. On July 14, 1881, the Kid breathed his last; he was shot once in the chest (The second bullet missed). After finishing his term as Sheriff (in 1882), Patrick Floyd Garrett became a rancher and published a book, The Authentic Life of Billy, the Kid, his first-hand account of his experiences with McCarty, which helped raise the Kid to the level of a historical figure. Framed (with a tan inner mat and a brown outer mat, with a photograph, in a Western style frame) dimensions: 19 1/4 inches wide by 15 1/2 inches high.